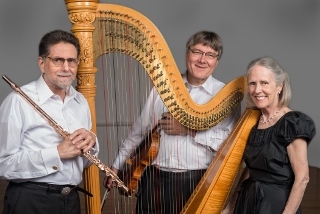 Boston's esteemed Ensemble Aubade (Peter H. Bloom, flute; Francis Grimes, viola; Mary Jane Rupert, harp) to perform at Herkimer College on April 20 at 7 pm. Chamber music by Claude Debussy, Maurice Ravel, Arnold Bax, and Ladislas de Rohozinski. Ensemble Aubade concertizes across the country, acclaimed for superb artistry and captivating performances. The group has been hailed for "intensity, imagination, skill, and finesse" (St. Lawrence University) and "rich interpretations and beautiful contrasts" (West Claremont Center for the Arts). Peter H. Bloom, flute, whose playing has been called "a revelation for unforced sweetness and strength" (The Boston Globe), performs in the U.S., Canada, Europe, and the Far East; is featured on more than 40 recordings (Sony Classical, Dorian, Leo Records, other labels); is a faculty member of the Snow Pond Composers Workshop; and is a winner of the American Musicological Society's Noah Greenberg Award. He has concertized in London, Bangkok, Canberra, Wellington, Ottawa, and other world capitals, and in hundreds of cities across 40 states and four continents. He is a veteran of the legendary Aardvark Jazz Orchestra (45th season). Mary Jane Rupert, harp, praised by The New York Times as exhibiting "indeed real sensitivity," has performed throughout the world from Carnegie Recital Hall to the Beijing Concert Hall. She has appeared as concert pianist and harpist with chamber ensembles, choral groups and orchestras across the United States. She serves on the faculties of Boston College and Tufts University and taught previously at Western Michigan University, MIT, and Wellesley College, where she taught harp for 20 years. Francis Grimes, viola,has performed with the Boston Pops, Boston Opera, Boston Ballet, Masterworks Chorale and other distinguished ensembles, and regularly serves in the orchestras of the Colonial and Schubert Theatres. He toured nationally with the Star Wars Orchestra and has performed with choral groups in England, Italy and the Czech Republic. Peter H. Bloom and Mary Jane Rupert, performing as the Duo "2", have toured New Zealand, Australia, Thailand and across the United States. They've been called "the very best players playing at the height of their powers" (University of Canberra College of Music, Australia).